Today I will introduce you a famouse restraurant in Thai. fine-dining Thai restaurant that remained true to local recipes and preparations. the varied and sometimes strong flavours that define Thai food. took note of this circumstance and decided to so something about it. Bussaracum Thai restaurant was the result. enjoy well presented and well prepared Royal Thai Cuisine. for his "BOOK OF THE BEST". Bussaracum serves exquisite Royal Thai Cuisine in an elegant, relaxed setting. It's the place to take all your visiting guests and VIPs. And much more drink lists and desserts. Besides there are also a cooking class and carving class. "Royal Thai Tastes of Bangkok Thailand"
Cooking Class, including buffet lunch. at Bangkok's "Royal-Thai Cuisine Restaurant," Bussaracum. very same dishes you have helped to create. Royal Thai Kingdoms that have played a part in Thai history. 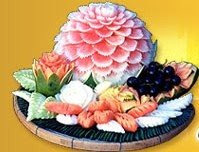 special, in taste, flavor, ingredients and decoration. Phone: 0-2266 6312-6 or Fax: 0-2266 6317. 139 Sethiwan Tower, Pan Road, Silom, Bangrak, Bangkok, Thailand 10500.